A man wakes up, face down in the pool with a bullet wound in his chest. He doesn’t remember his name, his life or how he got there – or how he died. Or how he’s still walking around. He is a zombie and he has so much to learn about that – a full list of questions in fact. As he learns how to survive as an alcohol soaked member of the undead he finds his habit of asking questions sets him up to solve many other cases. 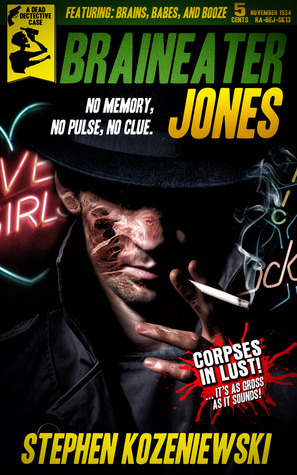 Braineater Jones, zombie PI, with many questions, few answers and a whole whacky noir world to navigate. This makes Braineater a slur among their community and more than one vampire is outraged by Jones, who doesn’t remember much or anything of his human life, chooses to use it as a name. The story itself is very very twisty in classic Noir style. We have shocks and surprises. We have twists and turns. There’s lots of double crossing and lots of misdirection and lots of people being the complete opposite of what you expect them to be. The whole idea of what’s being explored and examined changes from chapter to chapter with Jones both desperately trying to drag up some memories of his past life, some indication of who he was and why he died – or who killed him since he has a big bullet hole. Throwing in just learning what it means to be a zombie on tip of that – there’s a lot to get through. And that’s something of the problem. There’s a lot to get through and the book isn’t that long and we just sprint through it all. Along the way we kind of lose things like motivation, development or exploration. I don’t know why Jones has decided to become a detective. He doesn’t exactly do a lot of work to figure out who he was nor to really try and regain his memories. He becomes super suspicious about people and I’m not quite sure where the suspicion comes from. He develops friendships and positions where I’m not sure where they’ve come from and many of them apparently become passionate and deep very quickly. It feels like we have an excellent book, or even an excellent series of books, with complete interesting world building and a really twisty complex storyline. But then it felt like an over-eager editor decided to cut huge chunks of development and exploration from the book leaving it all a bit too fast and just a bit hollow and unsupported in places. Interestingly this book has a preamble from the author in which they are conscious that this story is written at a time where prejudices were overt and common and that the voices of the characters reflect that. Basically it has a foreward warning that recognises and cautions that overt sexism, homophobia and racism will be present in this book to reflect the time. It’s interesting and positive to have this kind of warning at the front of the book and an overt acknowledgement that this language is harmful to people. At the same time it’s almost surprising because I have read waaay worse without the “excuse” of a historical context – it’s almost like the warning should be in another book. Sure the language is far from appropriate but largely not gratuitous in its references. I appreciate the warning but have to say the book itself, which contains POC and bisexual people and women, doesn’t apply anachronistic acceptance but nor does it really revel in the bigotry it could. There are Black characters, a fairly major Latino character, a bisexual protagonist and some powerful women. However, there are problems and these problems are glaringly not addressed by the warning either. The warning would explain why people use racist terms to refer to a Black character. Not why that Black character acts like someone contacted central casting for a “Black pimp”. You can have characters refer to women in objectifying and sexist terms because of the era and attitudes – but when we have a brothel that reduces zombie women to body parts to be used interchangeably – that’s not attitudes, that’s a depiction of characters that way. There’s a different between depicting prejudiced opinions and having reality present those opinions as truth. Through the book we have strong metaphors for class and underclass that are very powerfully depicted, with us clearly seeing the zombies as they are treated as non-citizens. On top of that we still have depictions of, for example, the Haitian community that still face considerable poverty and exploitation even when depicted in a villainous role. So conclusion on this book? It has a somewhat diverse cast albeit far from well done but with an awareness of these issues. It has a lot of humour and is repeatedly and genuinely amusing. I don’t think I ever laughed out loud but I definitely grinned and smiled a lot. But most of all I have to praise the originality of this world. The noir, the humour, the world setting, the whole idea of alcohol as a preservative, the inevitability of death, the oldest member of the zombie community is definitely surprising as well as the looming destruction that lurks over zombies. This is new. This doesn’t even come close to anything I’ve read before and that is worth a whole lot of points right there. For novelty alone, I’d pick up this book – and I’d stay for the humour, the amusement and the really twisty story. But it needed more – we needed more to see Jones as a PI to have him established. He needed more cases, more time to get into this world, more time to show his strengths, more time to show why anyone cared about him.